These western style tops long dress are highly appreciated among our customers for their resistance to fading, vibrant color combination, smooth finish and elegant appearance. These dresses are perfect to wear in any occasion and can add a touch of beauty to the wearer. This western top is made of good quality fabric Top that is looks best as a casual evening wear Western Tops and latest kurtis for girls to wear in official meetings, casual and other day wear events. 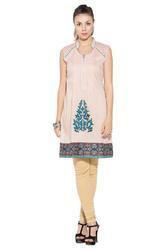 Ladies Fancy Kurtis Nikhaar features elegant women's kurta in the most comfortable cotton fabric. This elegant sleeveless kurta in a pink shade has a V shaped neck with multi-coloured prints in the front and the tail pattern accentuates its charm. Team this with white leggings, peep-toes and matching danglers and enjoy the attention that you deserve.The offered range of top tunic kurtis is hugely acclaimed among clients for its striking patterns, attractive designs and stylish look. Further, to meet the diverse requirements of the client, we are offering these tunics in many attractive designs, patterns, prints and colors. Clients can avail these tunic kurtis from us at competitive prices. Update your wardrobe with stylish cotton kurtas from Nikhaar that are crafted with care to make you look attractive. This sleeveless kurta in a lavender hue has a round slightly collared neck with a zip-line in the front, elegant designs at the bottom and along the hem. Team this with a pair of beige leggings and heeled slippers and step out in style. Offered ladies fashion kurta is designed & developed by our experienced and highly skilled fashion designers. To manufacture these kurtas our professionals make use of excellent quality fabric and imported threads. These kurtas posses many quality attributes like smooth texture, skin-friendliness, shrink & odour resistance and color-fastness. Add style to your party wear outfits with this black cotton kurta with red floral highlights from Nikhaar. 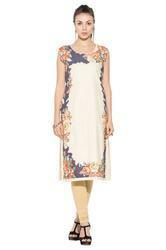 This solid kurta features a collared V shaped neck, is sleeveless and has slits at the sides. A perfect party wear, you could team this with white leggings. Desigenr Ladies Kurtis/Tunics/Kurtas/Tops.We have attained our achievements by obtaining the best quality products.We supplied fashionable trends..
EMbroidered Kurtis Enhance your closet with this unique design from Nikhaar. This cotton kurta has shades of white in the front and a striking blue at the back. It has a V shaped neck, full sleeves, attractive prints and slits at the sides. Pair this up with white leggings and fashionable earrings for a casual look. Drive your blues away with this beautiful blue cotton kurta from Nikhaar. It has three-quarter sleeves, a round neckline with attractive prints in the front and along the hem. Team this with matching blue danglers, white leggings and heeled shoes and get set to rock the party. Nikhaar presents to you a range of gorgeous cotton kurtas that you can wear at your office party .This sleeveless solid blue kurta has a V shaped neck with a detailed pattern along the neckline and pretty designs at the bottom and along the hem. Team this up with accessories, white leggings and heeled slippers to look classy. We are offering Designer Kurtis Tunic which are fabricated using pure cotton fabric and can be embellished, designed and styled as per the different requirements of the customers. We have a multiple range of Ladies Kurta Kurti Top Tunic of Varied price order and design patterns. Our fine and delicate weaved fabrics are tested for the tear strength and shrink Resistance before being designed to perfection. Ladies Kurtis. Showcase your feminine side with elegant women’s kurta from Nikhaar. This sleeveless cotton kurta in a white shade has a U shaped neck and attractive pattern across the chest and at the bottom in the front. Team this with a pair of black leggings, heeled sandals and rush to any party in style. We are offering Designer Kurtis Tunic which are fabricated using pure cotton fabric and can be embellished, designed and styled as per the different requirements of the customers. We have a multiple range of Ladies Kurta Kurti Top Tunic of Varied price order and design patterns. Our fine and delicate weaved fabrics are tested for the tear strength and shrink Resistance before being designed to perfection.